A Far Cry hangs out somewhere idyllic. Photo: Yoon S. Byun. My apologies - almost three weeks have gone by since I heard A Far Cry's season opener, "Back to the Idyll," and I am only now posting about it! My only excuse is that I've been off in an idyll myself, roaming over Tuscany, the Veneto, and Lombardy. Still, I owed the Criers a more timely response, particularly as the first item on their program, Thomas Adès' famous "Arcadiana," proved the most transporting performance I've ever heard from this enterprising young group. Their achievement was even more striking given that the Criers had arranged their own subtle expansion of Adès' spare quartet; indeed, I'd argue their string orchestra version could enter the repertory on its own as a variant that always equalled the original, and in one key passage ("O Albion") surpassed it. But first a word about "Arcadiana," surely one of the greatest pieces of music composed in the last few decades - although it could hardly be called original in the conventional sense; indeed, intricate as it is, "Arcadiana" is generally a haunting gloss on other (sometimes iconic) pieces of music. And it only relates to the idyllic in a mournful way - in fact it's rather like a musical poem in the mode of Eliot's Waste Land; it inches toward its vision by constantly referencing great works of the past. I suppose those works themselves - the Western musical Pantheon - could count as the "idyll" of the concert's title. But Adès' vision of that tradition is rather more like an evocation of its disappearance; and if Eliot cast himself as lost among cultural ruins, Adès conjures instead a sense of softly accelerating aesthetic collapse; his music - and the music "within" the music - seems to be being diminished (perhaps even erased) as it is written. The salient literary theme here (and few musical works are more literary than this one) is the pithy memento mori that Poussin etched directly into his classic canvas, "Et in Arcadia ego" (below): "Yet am I in Arcadia," that is to say, the reaper stalks every idyll. 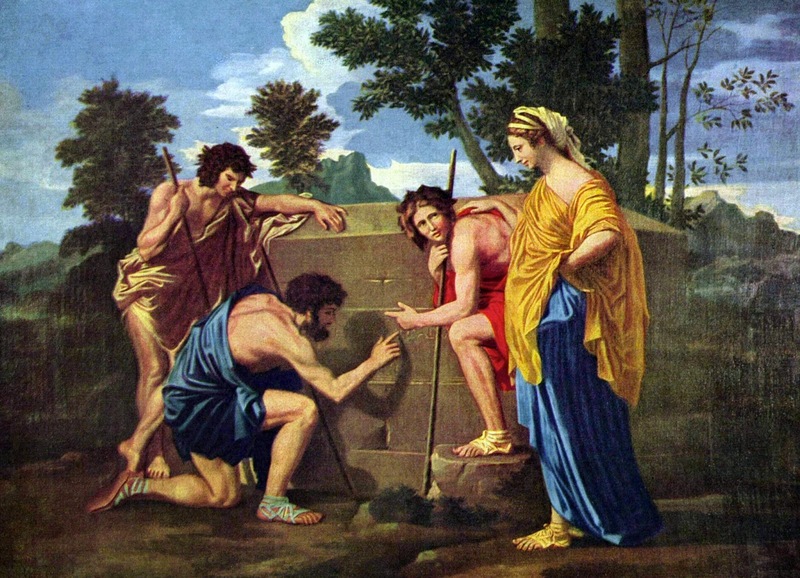 Poussin, "Et in Arcadia ego." But Adès is not after a glimpse of personal mortality, but rather a sense of death on a vast cultural scale; the seven brief sections of "Arcadiana" reference Mozart, Schubert, and Debussy as well as Poussin and Watteau - his allusions slip by too quickly to be fully grasped on a first listen, in fact. But then that's the whole idea: his nods to this or that aria or phrase are just half-memories, and the distinctive details of the originals seem to be lost to us as we listen; in "Arcadiana," the entire seductive Western tradition isn't being remembered - it's being forgotten. The piece closes with "O Albion," an extended meditation on Elgar's poignant "Nimrod" that feels like an elegiac sigh for the whole English nation, which is followed by a soothing dip in the river "Lethe" - which washes the last remnants of memory away. It's a quiet but still shocking close to a piece that's both brazenly audacious and subtly crafted - and somehow the Criers' version honored both these attributes. Their expansion of "O Albion" was particularly moving - nudging Adès' muted threnody just an inch closer to Elgar's scale made it even more heartbreaking. And needless to say, the Criers played the arrangement with an admirably transparent intensity; indeed, I'd count their performance among the most striking of contemporary music I've ever heard in the Athens of America. I suppose it was too much to hope, then, that the rest of the concert could sustain the same level of excitement - although the Criers' take on Shostakovich's Violin Sonata (again in an expanded version that turned it into a kind of string concerto) was riven with an admirable melancholy. But this sonata was originally cast as a dialogue between violin and piano, and the sense of conflict that Shostakovich thereby embedded in the piece seemed to be lost along with the chiming of the keyboard. Still, the dazzling violinist Augustin Hadelich - who always seems hovering on the edge of a popular breakthrough - led the work with fierce, at times nearly hysteric, intensity (although he rarely evoked the scratchy dance that the long-suffering Russian threaded into even his autumnal works). And alas, weaker still was the Criers' take on Leoš Janáček's "Idyll," a kind of pastoral bouquet to Dvořák (with whom Janáček famously tramped over Bohemia) from a composer who would later become known for thornier, more modern work. The Criers gave the piece a sweet, folk-inflected lilt, but seemed to be playing with the voice of consensus; their tone had a gleaming but rather generic finish, and they seemed unable to tap into the personal (or musical) specificity of what can be a delightful musical jaunt. After their deep engagement with the far more difficult Adès, this was a bit of a puzzle; but perhaps they simply weren't really interested in going back to the idyll after all.